Gary Comer College Prep (GCCP), located in the Grand Crossing neighborhood on Chicago’s south side, was conceived from the Comer Science and Education Foundation’s core mission: to improve urban education and the lives of children. The 45,000-square-foot, state-of-the-art charter high school was opened in May of 2008 and is designed to be used in conjunction with the adjacent Gary Comer Youth Center. 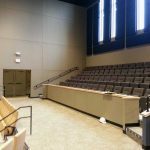 The two-story structure is comprised of classrooms, a lecture room, and administrative offices for GCCP, to be operated by the Noble Network of Charter Schools in Chicago. The school shares facilities with the adjacent youth center, where students use the gymnasium, cafeteria, music rooms, art rooms, and computer lab space. As of August 2014, GCCP is at full capacity serving 755 students in grades 9-12. GCCP students participate in youth center programming after school, on weekends, and during the summer. Most classrooms include several interior and exterior windows providing excellent use of daylight and the benefits of an open design concept for students and staff. However, school administrators are responsible for providing a safe, stable and innovative learning environment for GCCP students. Parents count on GCCP leadership to be prepared for any situation where immediate privacy is needed. – All the motorized shades are powered by ILT motors connected to the facility’s data network, allowing staff access to the shades in the entire facility from any device connected to the network. – All room-darkening fabric is No Lite Fiberglass, an opaque fabric with no view through. – All fascia is 4″ white aluminum to match the classroom decor. 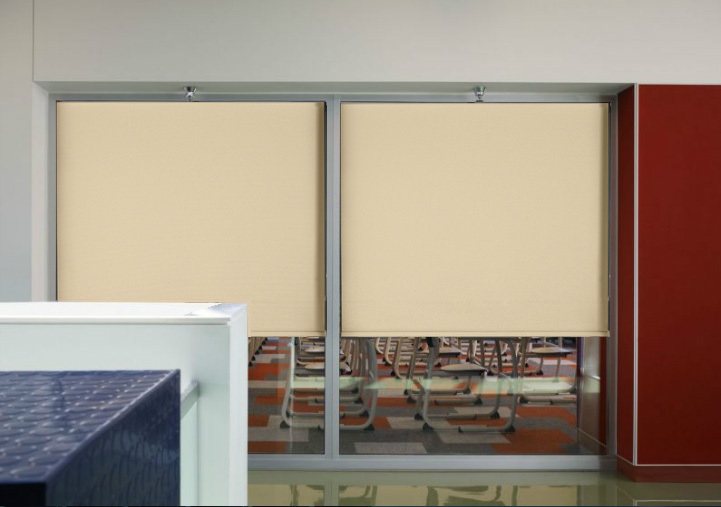 IWS designed a privacy shade system that is integrated with and controlled by the school’s data network, which allows appropriate staff access to the privacy shades in the entire facility from any device connected to the network. 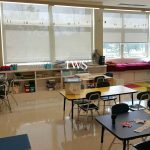 A total of 24 Illinois Window Shade Company motorized privacy shade systems were placed in classroom windows throughout the facility. These systems are expertly fitted with No-Lite Fiberglass opaque fabric and seamlessly concealed by 4“ white aluminum fascias to match the classroom decor. The blackout shade successfully blocks all solar and visible light transmittance, providing a perfect environment for clients seeking optimum privacy levels or for those utilizing audiovisual equipment. The privacy solution at Gary Comer College Prep looks fantastic, is easy for facility staff to operate and produces instant results with respect to the privacy and light levels in the facility. Educational institutions and architects across the country are working to design sustainable solutions that provide enhanced security measures for school staff and students. The proper window shade addresses these challenges in a cost effective and practical manner. Well-designed motorized shading solutions not only save energy and money, but also provide another layer of privacy and security when needed.